Starburst is a 10-line slots game from Net Ent that features fistfuls of gems for you to collect! String the same gems along any of the paylines and watch your winnings grow, while the Win Both Ways rule doubles your winning chances. Gather three Wild symbols across the centre reels and enjoy a free Re-spin! Read our full review below. If games like Bejewelled are right up your alley but you want to enjoy slots style action at the same time, Starburst is the perfect option for you. This glittering game draws its inspiration from the format and style of games like Bejewelled, but it adds extra bonus features and so much more. You can enjoy this free slots game right here and get in on the action anytime you choose! Created by game makers Net Ent , Starburst has been optimised for enjoyment on all platforms and can be played on desktop, mobile and tablet. The game's easy to use interface, brilliant design and bright colours make it instantly appealing, and players can have fun anytime, anywhere! Starburst is a fabulous online slots game that will suit both new and experienced players alike. It's beautifully crafted and looks almost 3D, making it a feast for the eyes, as well as loads of fun! On the reels are an assortment of dazzling gems in red, purple, yellow, green, blue and orange. There are also lucky number sevens and bar symbols, adding to the retro style of the game. However, it’s not all about retro-stylings. The game is set in outer space, with celestial bodies floating by in the background. There’s also an ambient, space-age soundtrack that plays as you spin the reels. There is definitely a great mix of old and new when you play Starburst slots – which is likely why this game is so popular among such a huge range of players. You’ll be captivated by the eye-catching graphics when you spin the reels. While the general look of the game is quite simple the bright symbols really pull you into the gameplay and make for an incredibly engaging gaming experience. Starburst is an innovative online slots game and it's made all the more exciting by the fact that players can win both ways on every spin. A 5 reel, 10 payline slot, Starburst has a top jackpot payout of 50,000 coins and is easy enough for even brand new players to get their heads around. Starburst has a betting range that starts at 0.01 and increase up to 1.00 and there are a total of 10 betting levels to choose from, regardless of what coin value is set. Although the game only has 10 paylines, its Win both Ways feature means that you have double chances of winning, so it plays out more like a 20 payline game. What Is The RTP Of Starburst? Starburst from NetEnt has an RTP of 96.1%. This number refers to the amount of money that is paid out as prizes for every £100 wagered. It is a theoretical number, determined by the game’s developer to give players an idea of how often they can cash in on prizes. However, if you’d like to find out your own personal RTP, you can always use this handy tool from Videoslots . This slot is also a low volatility game. What this means is that the game provides players with many frequent wins; however, they are much lower than the wins you would claim from a high volatility slot. This makes Starburst a low-risk online slot, so you don’t have to worry about blowing loads of money on the game before you can hit a win. To hit winning combinations while playing Starburst slots, all you have to do is land three or more matching symbols on the same payline. While it might seem like the prizes are a bit small, it is important to remember that this is a low volatility game. So, for example, you’ll hit 10 5x wins over the course of 20 spins in a low volatility game like Starburst. If you were to play a high volatility game, you’d hit 2 25x wins over the course of 20 spins. The result is essentially the same, but the way you get there is completely different. So, if you have the bankroll to support a game with infrequent wins, then high volatility games are the way to go. They are higher risk and many players consider them more exciting; but, we’d argue that low volatility games like Starburst slots are just as exciting, as you can watch your balance steadily climb over the course of your session. Starburst is packed full of feature and along with being able to win both ways, players will come across Wild symbols, Expanding Wilds, Free Spins and the option to Re-Spin. There’s an AutoPlay feature which allows you to sit back and watch the reels spin for a pre-determined number of times, ensuring you never miss out on a win even if you are otherwise occupied for a brief moment of time. There’s also the Skill Stop feature which is prevalent in many Net Ent games. This feature gives you the chance to choose when you want the reels to come to a halt, and although the game is still random, many players prefer having an element of control. Starburst has an exciting bonus round that adds extra excitement to every spin. The Wild bonus round will activate whenever the Wild symbols appear on the middle 3 reels, and when they do they will expand to fill them entirely with Wilds. During this bonus a Re-spin is also awarded, and if another Wild symbol appears another Re-Spin is given. Up to 5 Re-spins can be claimed in this bonus, making it very rewarding! 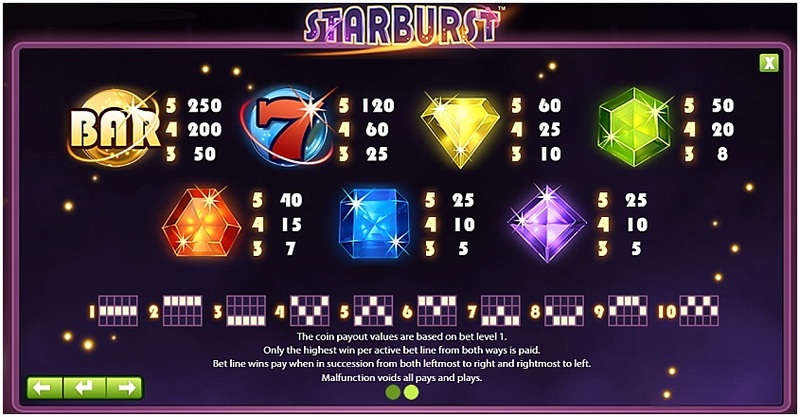 Starburst online slot offers players some hugely generous prizes, but there is no progressive jackpot available. The top jackpot in the game is worth 250x your line bet. So, if you wager 50p per line, the biggest single win that you can hit is £125. However, you can further increase your coin value and bet level for even bigger payouts. While the top single line win is worth 250x, you can also hit multiple winning combinations. If you land the top-paying symbol (the BAR symbol) on all paylines, then you’ll win a prize worth 50 000x your line bet. So, if you’ve wagered 50p per line, that is a huge £25 000 pay day. So, while a progressive jackpot isn’t available on Starburst online slots, there are still some amazing prizes available. Many players will bypass some slots if it isn’t a progressive game, but Starburst proves that a game with set prizes can be just as generous. There are no free spins bonuses in the actual Starburst game itself. The closest you’ll get to free spins in this game is the re-spin feature. However, this is still incredibly generous. When it comes to claiming free spins in online slots, you normally have to wait quite a while, as it takes three or more scatter symbols to trigger this bonus game. As such, over the course of 150 spins, you’ll likely only trigger the free spins bonus once or twice. However, when you’re playing a game like Starburst that only has re-spins, you’ll trigger this feature fairly often. This is because the feature is triggered by a single wild land on the reels. Obviously, this occurs very frequently when you’re playing any slots game, so you can cash in on all sorts of amazing respin “free spins” while playing this slot. Another great thing about Starburst online slots is that it is often the free spins game of choice at many online casinos. When you sign up to many online gaming sites, you’ll be offered a welcome package that consists of a match bonus along with free spins. The site will decide which game you’ll be able to play your free spins on, and it is usually Starburst. When you claim free spins from an online casino, the site will let you know how much your wager is worth. Usually, it is somewhere between 10p and 20p – but it still gives you enough to experience the game and enjoy it. You’ll be able to earn actual cash winnings or bonus cash, depending on the wagering requirements of the online casino. If you’re able to claim actual cash, then there is usual a max win of £100 imposed. So, if you win £125, you’ll only be able to withdraw that first £100. If your winnings are credited to your bonus balance, wagering requirements will apply. As such, you’ll have to wager your winnings a certain number of times (anywhere from 20x to 35x) before you can withdraw that cash. As an example, if you win £10 while playing Starburst free spins and there is a 20x wagering requirement, you will have to wager £200 before you can withdraw that first £10 prize. However, many online casinos release your bonus balance as cash little by little, so you don’t have to meet the wagering requirements all at once. More and more online casinos are providing players with the opportunity to grab no deposit bonuses. These are bonuses that are offered as soon as you complete the signup process. So, while most online casinos require you to make a deposit to claim free spins, no deposit bonuses allow you to play popular slots without having to spend any money. Starburst is one of the most popular games to be offered as a no deposit slot. If you sign up to any online casino that has a no deposit bonus, Starburst is likely the game that you’ll receive the free spins for. Just like with regular free spins, you’ll play your no deposit spins with a determined bet amount – which is normally about 10p to 20p. When you claim your winnings, they are usually credited to your account in your bonus balance, so wagering requirements will apply. Starburst is the perfect game to play from your mobile device, as it is quite simple. If you’re playing a game with very demanding graphics, it can be quite hard on your operating system, especially if you don’t have lots of RAM on your tablet or smartphone. When you’re playing online slots from a mobile device, it is important that you have a strong internet connection. Ensure that you’re in an area where your data won’t cut out or, better yet, ensure that you’re connected to Wi-Fi. There’s nothing worse than disconnecting from an online slot when you’re on a winning streak. That being said, you can also give this game a spin on your desktop computer, as well. While more and more players are using mobile devices to give their favourite slots a spin, you can still enjoy Starburst slots from your desktop device. You’ll have a much bigger screen and a better sound system so you can enjoy this fun online slots to the fullest extent. Virtual reality is the next big thing in both traditional and casino gaming. NetEnt is one of the first online casino games developers to experiment with virtual reality games, and has come up with some impressive results. Working with Slots Million online casino, NetEnt offers plenty of virtual reality slots and table games for players to enjoy. With a VR headset, you can walk around a virtual lobby and NetEnt games are shown as actual slot machine cabinets. You can step right up and play each game – with the reels broadcasted directly to you in your headset. You can view the game right before your eyes with no distractions from the actual world. When you hit wins, coins will fall from the sky and you’ll feel like you’ll fully immersed in the gaming experience. There are relatively few online slots out there at the moment that really integrate with virtual reality software. You’ll mostly find NetEnt games – but this is a trend that we imagine will catch on very shortly. Before you jump in head first playing this popular game, it is always a good idea to give it a spin for free first. This is why it’s important that you have easy access to slot demos. You should play 150 to 200 spins for free first before you spend any money on Starburst or any other online slots .This is because it is important for you to determine whether or not the game is up your alley. Every online slot is different, so you should definitely find out whether your personal gaming tastes and allocated budget suit any new slots you want to try. When you’re playing an online slot for free, be sure that your bet level is similar to what you would be wagering if you were playing with real cash. Then, you can make an informed decision about whether or not the game is ideal for you. You should also think about making a list of the slots features that you enjoy the most. This will allow you to narrow down your list of games to try for free, so you can get playing for real money sooner. Eager to give Starburst a spin, but just don’t have the time right now? Then, check out on 150 Spin Experience. We play the game for you to let you know what it’s all about, so you can decide if this is a game that you think is worth playing. The first thing we noticed about Starburst is how quickly the game loads. It only took a few seconds from the moment we clicked the link to the moment we were able to start playing. This is definitely an advantage of playing NetEnt slots like Starburst. They are so well-designed and fast-paced that you can get playing instantly. We set our wager to £20, as we felt that it was a fair medium between what a casual player would bet and what a high roller would wager. We checked out the autoplay options, and set it to spin for 100 rounds at first. Starburst immediately captivated us with its gorgeous graphics. The game is set in space with the sun shinning in the background and star floating around. All of the shimmering symbols are eye-catching. As you spin the reels and hit winning combinations, they burst out rays of light. You definitely feel excited when you spin the reels on this game. What we were most impressed with was the amount of wins were able to accumulate, and how often they occur. Over the course of 150 spins, there are never a period of more than 30 seconds where we were without a win. Granted, it is a low volatility game, so the wins were quite smile – but we did cash in on some big ones, too. Thanks to the generous respin feature, we were able to hit some amazing prizes. There were several instances where we claimed one re-spin thanks to an expanding wild appear on the screen, and received another immediately due to another wild landing right beside it. This is where our biggest wins came from. So, even though Starburst is a low-volatility game, it also has the potential to pay out some very big prizes. You won’t find many low-volatility slots that offer the same type of experience – so, it’s no wonder why so many players around the world enjoy playing Starburst. Our biggest win over the course of the game was worth an impressive £2504s. Since our line bet was 50p and our total stake was £20, this offered up a win worth 50 000 coins (or 125x our stake). By the end of our session, we had cashed in on a total of about £2100. This is definitely more than you would expect from a low volatility game. Starburst online slot provides nonstop excitement over the course of 150 spins, and there never seems to be a lull in the action. The game offers players a great online gaming experience with plenty of wins and some very generous winning potential. Starburst is certainly one of the most popular online slots in the online casino world, but we can understand if you’d want to mix it up a little bit. Luckily, there are plenty of similar games out there that we can recommend that you might like as much as (or even more than) NetEnt’s Starburst. Hologram Wild is a Playtech-powered online slot that provides players with plenty of opportunities to win big. The game features a holographic theme with classic fruit machine style symbols. You’ll encounter overlay wild symbols that help to boost your odds of win, plus there is a free spins round that can be retriggered over and over. This Thunderkick slots game slots quite similar to Starburst with its space theme and vibrant symbols. The game features 15 paylines and offers players a generous 24x top prize, as it is also a low volatility game. The wild symbol appears as stacks and it the free spins round doubles your winning ways to 30. Glow is another NetEnt slot with 10 paylines. The game features graphics that are based on the Northern Lights, and there are some impressive payouts available worth up to 2500x. It also provides players with the chance to earn free spins during which all wins are doubled. In NextGen’s Flame online slot, you’ll experience vibrant graphics and an overall stunning theme. This 25-payline game offers up a top prize of 750x your stake, and there are plenty of generous bonus features, including re-spins with sticky wilds. Starmania is another NextGen-powered online slot that provides players with plenty of winning potential. This 10-payline slot features dazzling graphics and a fun free spins round. You can also take advantage of the gamble feature to double your payouts every time you hit a winning combination. A Thunderkick slot, Spectra provides players with a neon theme and a 5-payline format. Like Starburst, every wild symbol that lands triggers a re-spin. The wilds also nudge towards the centre of the screen to help you land more generous winning combinations easily. Space Gems is a simple online slot from Magnet Gaming with a classic 3-reel format. The game features a theme that is similar to Starburst, and players can cash in on generous progressive jackpots as the spin the reels on this slot. Tut’s Twister is a fun slot from Yggdrasil Gaming. It features an Ancient Egyptian theme, which could be further away from Starburst’s space motif – but it offers similar gameplay. It is a 25-payline slot which features an expanding wild symbol. It is triggered when two or more wilds land on the reels, and collects all subsequent wilds that land to award you with a huge prize when the re-spin bonus is finished. Dwarfs Gone Wild is a Quickspin-powered online slot that features a cute and quirky theme. The game offers up 30 paylines with generous winning potential, and players can trigger all sorts of fun wilds during the free spins round. Secrets of the Phoenix is a gorgeous online slot from Gamesys. This eye-catching game features 25 paylines and cascading wins that help you land winning combinations easily. You can also benefit from increasing multipliers and expanding wild symbols. Give any of the above games a spin for an exciting online gaming experience that provides just as many thrills as Starburst. It’s always fun to mix things up a little bit, and the above games will keep the excitement coming when you’re taking a break from Starburst. At Slots Temple, we take our gaming very seriously. That’s why we have a group of online slots experts to give you the low-down on the top games in the market and let you know what we really think of these games. When reviewing Starburst slots, however, it was difficult to find anything bad to say about it. Even though the game was released back in 2012, it has definitely stood the test of time. What was surely a ground-breaking game back then continues to be a huge hit. The graphics don’t even seem very dated, as there are plenty of new releases that don’t even look as good as Starburst. The first positive of Starburst is its overall variance. Even though it’s a low-volatility game with an average RTP, it really does pay out some amazing wins. You’ll never go more than half a minute without winning – and, while games like this only pay out smaller prizes, Starburst definitely allows you to accumulate them quickly. On top of all this, there are some huge payouts available, too. The re-spin feature allows you to hit multiple expanded wilds for the chance to create payouts worth up to 50 000x your line bet. It’s not often that low-volatility slots offer this kind of opportunity outside of the free spins round. If we could change anything about the game – first, we’d have to think really hard about it, as Starburst is such an impressive slot – we would probably add another bonus feature. If you’re a modern gamer, you might want a second-screen bonus game, so Starburst could possibly benefit from a pick-a-prize round that takes you away from the base game and mixes things up a little bit. Either way, Starburst is the kind of online slot that will appeal to just about everyone. We can’t think of any player that wouldn’t enjoy themselves while spinning the reels on NetEnt’s hugely popular Starburst slot. NetEnt is one of the leading online slots developers in the casino market. The company has been around for decades, and continues to provide players with top-quality games. It’s not often that you hear about an online games developer getting its start in the 1990s, but NetEnt is an exception. The company was first founded in 1996 and launched its first online casino in 2000. By 2003, the company was distributing its Casino Modules to plenty of customers around the world, and received its Malta Gaming License two years later. In 2010, NetEnt launched its huge hit, Gonzo’s Quest . The game became hugely popular, as it was one of the first slots to feature 3D graphics and cascading symbols. Riding this wave of success, NetEnt decided to venture into another type of online gaming innovation the next year – mobile gaming. Over the years, NetEnt has continue to expand around the world, entering regulated markets like Italy, Mexico and Serbia. So, no matter where you are in the world, you’ll be able to enjoy playing NetEnt online slots. Every month, you’ll see new and exciting slots from this developer, so always keep an eye on our news page to find out all about the fresh new content from NetEnt. The studio aims to release a wide variety of slots that will appeal to all types of online slots fans. So, whether you enjoy playing classic-style slots or more modern games, you’ll always find something to enjoy from Starburst. Can I Play Starburst Slots For Free? You can give NetEnt’s Starburst slot a spin for free right here at Slots Temple. There’s no need to sign up to an online casino or make a deposit. Does Starburst Slot Have Free Spins? There are no free spins in Starburst – but you can trigger respins whenever a wild lands on the reels. Can I Win Real Money While Playing Starburst Slots? You can only win free spins while playing Starburst if you sign up to an online casino and deposit cash. There are also plenty of free spins bonus at casinos that allow you to play games like Starburst for free – but wagering requirements will apply to your wins. Do You Have An Starburst Tips or Cheats? There is no way to guarantee a win while playing Starburst slots online. All online slots rely on Random Number Generators (RNGs) to ensure that the outcome of every spin is completely random. As such, you cannot predict when Starburst will pay out or manipulate the outcome of the game. Always remember never to chase losses. Even if you’ve depleted your budget for the day, just walk away from the game and try again later. It is also a good idea to set a win limit. While it might be fun to ride the wave of a winning streak, you don’t want to lose all of your winnings in a single session. Can I Play Starburst Slots with No Deposit? No deposit is required to play Starburst slots free here at Slots Temple. There are also several online slots that offer no deposit bonuses that feature Starburst as a free spins slot. Can I Download Starburst Slots? All NetEnt games are available at HTML5 games. This means that they’re available to play directly in your web browser, and there’s no need to download any software to your device. * Starburst trademark / license is owned by Net Ent. This site is not endorsed by Net Ent.